An enterprising village brought back a tradition that's paid for itself. 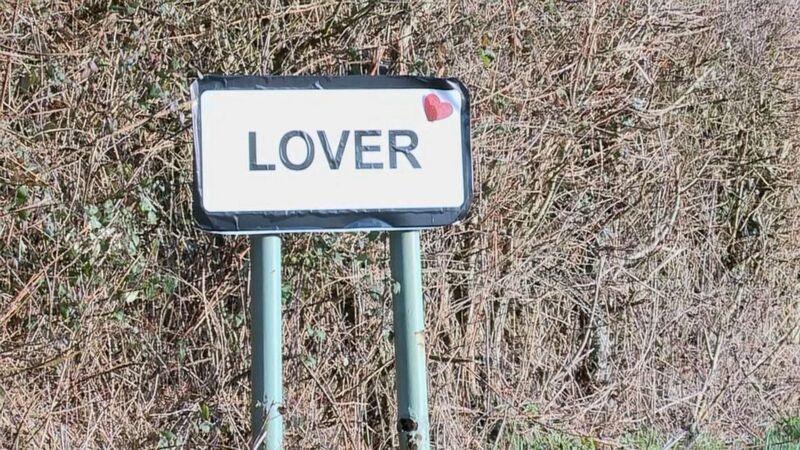 Lover, a small village in southern England's New Forest, is pronounced "Loaver" -- like Dover. The first thing you notice upon arriving is all of the hearts. They hang from trees and fences, they decorate houses -- hearts of every size, fluttering in the breeze. Lover is living up to its name as the most romantic village in the world. For many years, its romantic reputation grew as more and more people, in the days running up to Valentine's Day, would send their cards to the village post office to get them stamped. What could be more romantic than mailing a card with "Lover" stamped on the envelope? 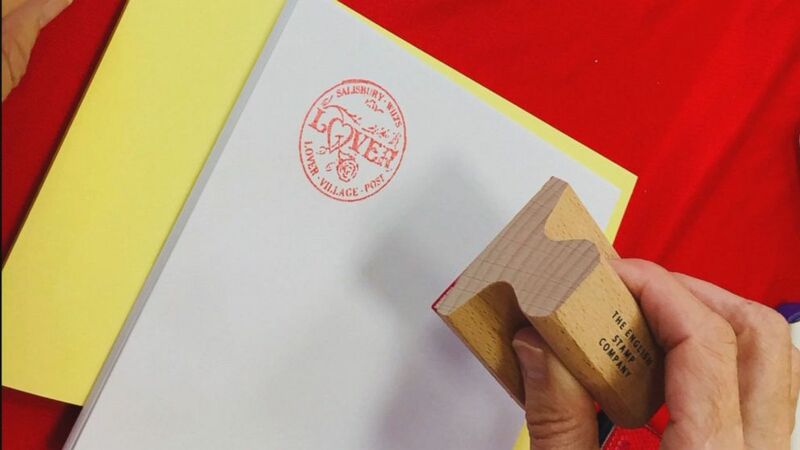 (ABC News) A pop-up post office in the English village Lover allows visitors to get their Valentine's Day cards stamped with an official Lover "cachet" stamp. But, sadly, the town's post office closed in 2008, shortly after the local school closed as well. The villagers banded together to purchase the school and turn it into a community center, but they had to figure out how to pay for it. "We got together," Katie Gibbs, of the Lover Community Trust, told ABC News, "and decided, Why don't we bring back the Lover Valentine post?" And that's exactly what Gibbs and her fellow organizers did, opening a pop-up post office in the old school. People can visit and purchase a Valentine's Day card or take their own and get it stamped with the official Lover "cachet" stamp. Cards also can be purchased online for $7 to $11 and mailed anywhere in the world. 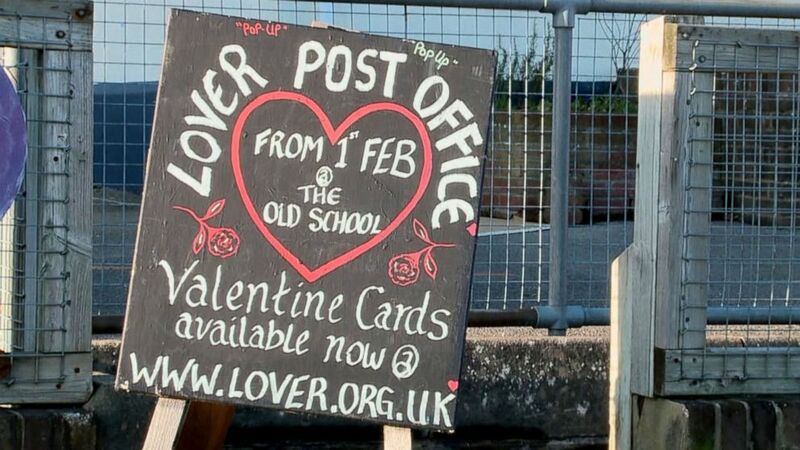 (ABC News) A post office in the English village Lover allows visitors to get their Valentine's Day cards stamped with an official Lover "cachet" stamp. "We have reached every single continent so far except Antarctica," Gibbs said. The pop-up post office buzzes with good-natured volunteers dressed in red sweaters as they organize and stamp cards. There are three shifts per day, with each shift processing about 1,000 cards. 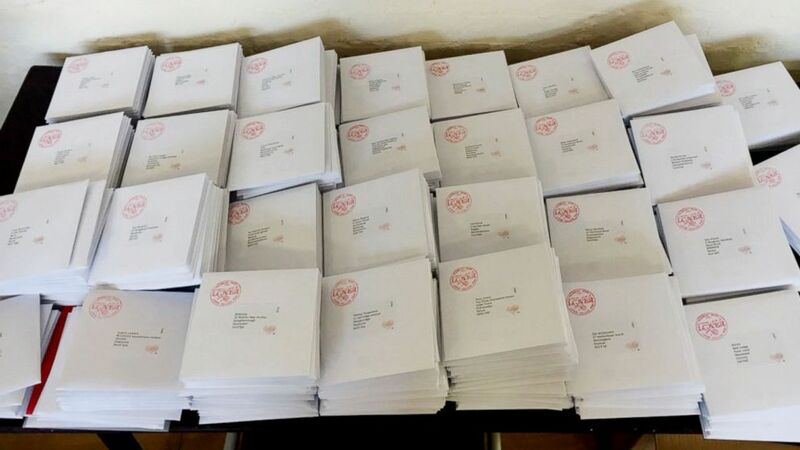 (ABC News) A pop-up post office in the English village Lover offers visitors the change to get their Valentine's Day cards stamped with an official Lover "cachet" stamp. This is the third year of the reincarnated Lover Valentine post, and the villagers have raised enough money not only to buy the old school but to transform it into a truly fantastic community center. It's the tale of an enterprising village carrying on tradition -- and sending "love" to the world.